JLo Live Luxe is more luxurious, sophisticated and glamorous, more sweet and tart. 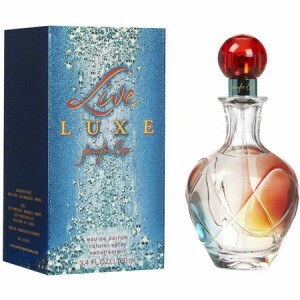 JLo Live Luxe 100ml. EDP is a successful artist: singer, actress and fashion designer - Jennifer Lopez, known for J.Lo logo, introduced in the market in 2006, Jennifer Lopez Live Luxe perfume, fragrance inspired by Latin rhythms and love for dance and luxury. Early tones of perfume will delight the fresh notes of melon, juicy pears and peaches, then you will be wrapped in fresh notes, citrus, apples arrangements, freesia and nutmeg. Jennifer Lopez Live Luxe perfume base consists of sensual sandalwood, musk, vanilla and honeysuckle. Jennifer Lopez Live Luxe is a daily perfume, floral-fruity, euphoric and passionate! a fragrance for women, belongs to a group of flavors floral fruit. Live Luxe released in 2006. Perfume: Claudette Belnavis. Top notes of melon, peach and pear; middle notes are honeysuckle, pink freesia and lily of the valley; base notes are sandalwood, amber, musk and vanilla. The artist in the creation of Live Luxe inspired temperamental southern rhythm, love to dance and all the luxury. First, they dance on the skin tones of fresh watermelon, juicy and delicious pears peaches. Then comes the solo for a wave of fresh citrus, apple and floral accords of freesia, and geranium. The base is formed by scorching heat of sandalwood, sensual musk, vanilla and irresistible sparkling honeysuckle. Jennifer Lopez Live Luxe is a floral fruity fragrance suitable daily wear. Can you wake up in absolute euphoria and feel passionate moment a hot summer night.